Beef Tips, Mushroom and Shallots, main course, from Thyme for Cooking. 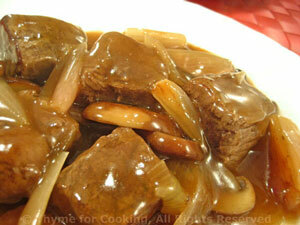 This uses a better cut of beef, sirloin tips, and is not meant to be braised for a long time. If you get a really nice, tender cut, don't braise at all, keep medium-rare. Just brown quickly, and add to the sauce at the end to reheat. Heat oil in a medium skillet. Add beef and brown quickly on all sides. Peel shallots and cut into quarters vertically. After removing beef add shallots and mushrooms to skillet, sauté until starting to brown, 5 - 7 minutes. Add broth, sherry, Worcestershire, browned beef, cover and simmer, 30 minutes. Uncover skillet, increase heat, add cornstarch, stirring until thickened. Serve.